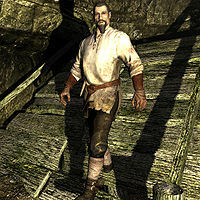 Odfel is a Nord miner that lives in Shor's Stone and is a potential marriage candidate. Odfel states that he used to be a soldier and acts with a general disdain and smugness towards others. Odfel starts off his day by waking up at 5am and spending an hour resting in his house. At 6am, he heads off to Redbelly Mine to start work. He works at the mine for most of the day, tirelessly mining for twelve solid hours. At 6pm, he finally stops working and goes home to rest for an hour. At 7pm, he goes to the campfire in the middle of town. He spends four hours sitting around the fireplace and sometimes using the cooking pot. At 11pm, he heads back home to sleep for six hours, and repeats his schedule the following day. Odfel wears a set of miner's clothes along with a pair of gloves and boots. He carries a pickaxe, the key to his house, a belted tunic, and a selection of common loot and gold. Before taking care of the frostbite spiders inside the mine, Odfel can often be heard complaining about them: "Everything was going great in Redbelly. Then the damn spiders showed up." At any time, he will be quick to tell you that his life as a miner is much more difficult than your life as an adventurer: "You think you're tough, huh? Wandering Skyrim is a picnic compared to tunnel crawling!" He will then elaborate on this: "The real work happens in places like this. Blood and sweat is what makes the world turn." To back up his claim, he will compare his current profession to his days as a soldier: "Sure, I used to be a soldier... but that was child's play compared to cracking rock." Despite how difficult he feels his job is, he seems to be quite content with his life as a miner: "Mining's my life now, I wouldn't want to do anything else." If you ask Odfel to tell you about the mine, he will talk about his unique pickaxe, Rocksplinter: "Mining iron takes a lot of strength and special reinforced tools. I must have broken five or six pickaxes in the last few months alone. But now that I've got Rocksplinter here, I can cut through stone like a hot knife through butter." Upon ending conversation, he may wish you, "Fortune to you and your children." Odfel: "Grelka [sic], do you fancy a walk tomorrow?" Sylgja: "Odfel, I've told you time and time again. I'm not interested in a relationship with you." Odfel: "And why not? I'm handsome, strong and smart. What else could you possibly need?" Sylgja: "I need someone that cares about me more than they care about themselves. That person isn't you." Odfel claims to have a unique pickaxe, Rocksplinter, that can "cut through stone like a hot knife through butter." However, he's just carrying an ordinary pickaxe; Rocksplinter is unobtainable in the game. This page was last modified on 12 July 2017, at 19:23.